There are a number of buyers who are confused between buying the Renault Duster 85 PS and buying the Renault Duster 110 PS variant. Which one is better value? Which one would suit you best overall? 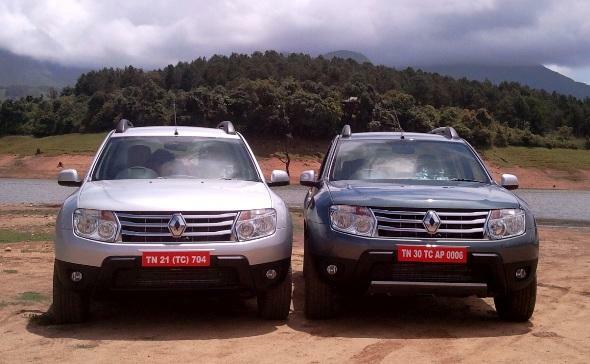 The fact that the Renault Duster has three engine variants – one petrol and two diesel – has given buyers more choice. Those looking for a basic entry-level variant with not too much monthly running (of under 800 km) are better off with the petrol Renault Duster. But those with substantial monthly running need to pick between the two diesels. The Renault Duster 85PS Option pack comes with features such as integrated music with Bluetooth, power adjustable mirrors, central locking, rear wash-wipe and fog lamps. The Renault Duster diesel RxL with the option pack includes all the features that the RxL variant offers and adds safety features and some cosmetic add ons. The option pack that costs Rs. 1 lakh more than the standard RXL variant includes five alloy wheels, ABS and EBD braking system, dual front airbags, seat belt reminder and reverse parking sensors. The Renault Duster 85PS is powered by the K9K 1,461 cc common-rail diesel engine that puts out 84 bhp of power at 3,750 rpm and 200 Nm of torque at 1,900 rpm. It is mated to a five-speed manual transmission driving the front wheels. Claimed mileage on this variant is 20.46 kmpl. It has a kerb-weight of 1240 Kg, giving it a power-to-weight ratio of 67.7 bhp per ton. However, where the 85PS is better is that it does not have much turbo lag, making it very drivable n the city with fewer gear changes required compared to the 110PS variant which has noticeable turbo lag. The 110PS version has a variable geometry turbocharger developing more boost and power from the same engine, with a six-speed manual transmission. The sixth gear allows the 110PS Duster to stretch its legs on the highway and cruise at a lower rpm. It has a claimed mileage of 19.01 kmpl. It puts out 108.5 bhp of power at 3900 rpm and builds 248 Nm of torque at 2250 rpm. This gives the 110PS a power-to-weight ratio of 84 bhp per ton, quite a lot more than the 85PS variant. So depending on where you expect to drive the Duster – choose between the 110PS RXL or the 85PS Option pack. The latter gives you more safety features as well for the same price, but is lower on power, while the former gives you more power, but knocks off a few features. Which do you think is a better deal? Share your thoughts with the CarToq community. « 9 most awaited car launches in India!